The EACC study team has taken two missions to Ethiopia to inform the Government and local stakeholders of the study and to collaborate with the Government and the National Forum on Climate Change (NFCC) on a national strategy for climate resilient development. The strategy’s analytical work including that for the EACC study will be coordinated through a “Climate Change Strategy Steering Group” co-chaired by Ministry of Agriculture and EPA, and including MARD, EPA, MWR, NMSA, MH, and MFDP. The EACC study's initial focus in Ethiopia is on agriculture, water resources, extreme weather events, social implications of a changing climate and energy. The EACC study team is working with the World Bank’s Africa Region on the study building on ongoing operations and established relationships. Ethiopia is extremely vulnerable to drought and other natural disasters such as floods, heavy rains, frost and heat waves. These extreme weather events cause loss of lives, property and disrupt livelihoods. 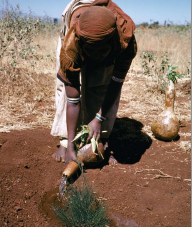 Ethiopia’s people are heavily dependent on rain-fed agriculture, which is affected by the impacts of climate change. Ethiopia is particularly vulnerable to drought which has caused loss of life and property as well as mass migration of its citizens. Global circulation models predict a 1.7-2.1oC rise in Ethiopia’s mean temperature by 2050. This could cause food insecurity, outbreak of diseases such as malaria, dengue fever, cholera and dysentery, malnutrition, land degradation and damage to infrastructure. Due to Ethiopia's vulnerability to extreme weather events its government has set in place initiatives such as the National Policy on Disaster Prevention and Preparedness, Plan for Accelerated and Sustainable Development to end Poverty (PASDEP) that attempts to directly reduce the impact of disaster. The Government of Ethiopia finalized its National Adaptation Program of Action (NAPA) in 2008 under the leadership of NMSA and is mobilizing financial resources for its implementation. The National Forum for Climate Change was launched in July 2008 by a Task Force chaired by MoARD. The Early Warning and Response Department (EWRD) of MoARD is preparing a Disaster Risk Management Policy for Ethiopia. The UNFCCC’s Standing Committee on Finance (SCF) has recently made its first Biennial Assessment of Climate Finance Flows Report (BA). The highlights of this report are outlined here.